Twickers, or HQ, as the ground is affectionately known by England supporters, has stood on the same spot in Greater London since 1907, when land that was used to grow cabbages was converted to host to rugby matches. The first international was played here in 1910 between England and Wales, and the ground has undergone constant development since then to arrive at the 82,000 capacity it boasts today. The stadium is now a world-class arena that hosts international matches, as well as the finals of European, domestic, county, inter-services and schools competitions, and the historic annual Varsity match between Oxford and Cambridge Universities, as well as concerts. In the World Cup era, the famous ground has hosted one final, in 1991 when Australia beat Will Carling's England 12-6, as well as both semi-finals in 1999. The second semi-final of that year was one of the greatest international matches of all time, in which France came back from the dead to demolish hot favourites New Zealand 43-31. 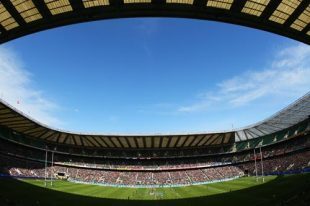 For the 2015 tournament in England, Twickenham is set to host one quarter-final, both semi-finals and the final. As befitting a stadium of this stature, the ground features state-of-the-art hospitality facilities, and also the Museum of Rugby, which covers not just English rugby, but the global game, recounting the history of the sport. Stadium tours are also available during the week. When England are playing, expect to hear the famous song Swing Low, Sweet Chariot ring out not only at the ground, but at the pubs and bars in Twickenham. Of these, The Cabbage Patch and The Rugby Tavern, both near to Twickenham train station, see record takings on international days, with supporters of both teams mixing and spilling out onto the pavements. Jonny May is tackled by Remi Tales.